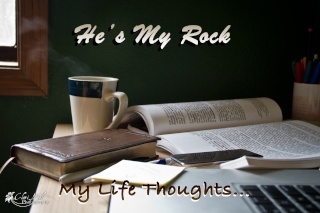 He's My Rock: His will. His will. His will. Not mine. Today is really not going well for me. At all. My computer crashed and we took it to the mac store - my harddrive is dead. My files aren't backed up. It's gunna cost at minimum $400 to retrieve the files. Our internet service is trash. It crashes sometimes literally ever 30 seconds... we've been on the phone twice with them...both phone calls over 3 hours and produced nothing. They aren't fully honest. Finally we have a service person coming out to look at our internet. But even in all this - God is in control. He knows what's going on. It's really hard to imagine why in the world he would let something like this happen. My files are a really big deal to me, specially since photography is what I do. All my photos-possibly gone. But I know I need to remember, God is in control. And these are just things of this world. They're going to burn up anyways. They aren't eternal. 1 John 2:15, "Do not love the world or anything in the world. If anyone loves the world, the love of the Father is not in him." Psalm has a lot of awesome verses about God always being with us. Psalm 136 is one of my favorite passages (post on it here) The same God who help David defeat Goliath - is in control of this situation. The same God who defeated armies with only a few men - is in control of this situation. Wow. I mean big WOW. God gives, God takes away, blessed be the name of the Lord. -In EVERY situation. Even losing files and internet. I mean those are NOTHING. Those are nothing. I've got Christ in my life. That's all I need.